A reliable source for Rotary Actuators information and a resource for accessing leading Rotary Actuators and suppliers. Rotary actuators are compact, simple and efficient linear actuators that rotate an output shaft through a fixed arc to produce oscillating power. They require limited space and simple mountings and can produce high instant torque in either direction. Rotary actuators are used for lifting, lowering, opening, closing, indexing and transferring movements. The various forms of energy that run rotary actuators include hydraulic, pneumatic, and electrical. Hydraulic rotary actuators are often used for steering or as an alternative to hydraulic cylinders or motors. Rotary Actuators Rotary actuators are compact, simple and efficient linear actuators that rotate an output shaft through a fixed arc to produce oscillating power. They require limited space and simple mountings and can produce high instant torque in either direction. Rotary actuators are used for lifting, lowering, opening, closing, indexing and transferring movements. For electric rotary actuators, there is a wide range of application including automotive power lock systems, fertilizer spreaders for farming and wind turbine construction. In addition, there are several important factors to consider upon selection of a electric actuator for a desired application, including actuator torque, range of motion and design. For instance, the two main types of rotary actuator designs are rack and pinion style and vane style, although a combination of these two styles is also possible. 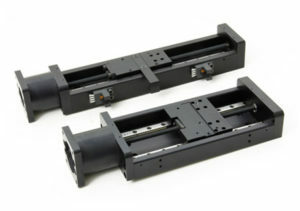 Rotary Actuators - Tusk Direct, Inc. The basic method through which rotary actuators provide rotary motion is through the rotation of an output shaft through a fixed arc. However, the three main types of rotary actuators each have different constructions. Hydraulic rotary actuators use pressurized fluid to turn motorized components. Either a circular shaft or a table can be used as the rotational element. Hydraulic rotary actuators are faster and stronger than pneumatic rotary actuators. Pneumatic rotary actuators use pressurized air to turn motorized components. Types of pneumatic rotary actuators include single rotary vane devices, double rotary vane devices, multi-motion rotary vane actuators, single rack-and-pinion actuators, and double or four piston rack-and-pinion actuators. Electric rotary actuators rotate from open to close using butterfly, ball, and plug valves. With the use of electric rotary actuators, the electromagnetic power from the motor causes the components to rotate, allowing for numerous stops during each stroke. Either a circular shaft or a table can be used as the rotational element. When selecting a rotary electric actuator, important factors to consider include the power that causes the rotation, while the full range of motion can be either nominal, quarter-turn, or multi-turn.